Elterwater Hostel is a newly independent, former YHA hostel. It is perfectly situated in the picturesque village of Elterwater, at the heart of the Langdale Valley in the English Lake District. 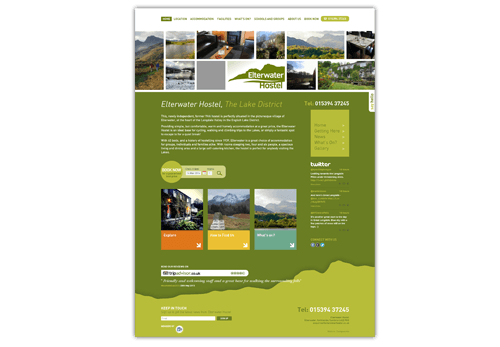 Designworks worked closely with the hostel’s new owners to create the brand and website for Elterwater Hostel. The logo features the famous Langdale range and the waves represent the lake of Elter Water. The site is built in WordPress using Responsive Web Design so it resizes for mobile and tablet devices. Focal points within the page design are online booking, contact form and Trip Advisor feed. These focal points offer routes to the essential areas of the site: book, contact and review.